Okay, maybe quoting the Green Bay Packers’ quarterback to address the Bulls’ current struggles seems a bit unconventional. Sinful, perhaps. But it worked for them so why not us, right? For one simple reason – this Bulls team is very good, and it is normal for good teams to struggle in the regular season. To help support my point, let’s look back on the last couple seasons at times when the fan bases of other teams prematurely panicked. Last season’s NBA champs, the San Antonio Spurs. The team we should have learned to never count out and yet we continue to when they don’t just roll through the regular season. But last year, on their way to an NBA championship and an amazing 62-20 record, the Spurs went through a stretch in January that was quite unkind. They lost to two other Western Conference contenders, the Trail Blazers and the Thunder and went on a three game losing streak (their longest of the season). In February, they lost to bad/middle-of-the-road teams Detroit, Brooklyn and Phoenix during a streak where they lost five of seven games. How did they respond? With a 19-game winning streak in March on their way to the title. In the year before, the Miami Heat started January by losing four of six games, with losses to contenders like the Bulls and Pacers, but also losses to the Jazz, Bucks and Pistons at the end of December and beginning of January. How did they respond? With a 27-game win streak in February-March, which was very memorably broken by the Bulls. Great teams know that championships are not won during the regular season. And the veteran teams and players know that in order to be ready to peak in May and June, you need to pace yourself in January and February. They know that losing to a bad team every now and then or losing a series to a conference rival means nothing when the playoffs begin. Look at the Miami Heat. During their championship seasons, the Bulls had their regular season number. And with every regular season win, Bulls fans went nuts, excited that we were better than Miami. But what happened with the playoffs came around? The better team won. So should we worry about losing to teams like the Jazz, Celtics and Magic? Should we worry about losing two straight to a conference rival like the Wizards? Maybe, but not right now. The ONLY thing we need to worry about is staying healthy. The Bulls need their complete team ready and healthy when the playoffs begin. The loss of just one of any of the Bulls’ core players could be enough to remove them from contention. This is a team built to win as a team. They do not have any one player who can carry them on their backs. The success of each player depends on the success of the others, and the biggest issue so far to me has been that they have just not gelled as a complete unit yet. Jimmy will play a great game, but Rose will be out. Pau will play well, but Noah will struggle. There is no LeBron, no Durant, no Melo on this team. They need to succeed as a group. So far, they have struggled to do that consistently. Yes, I’m tired of watching the Bulls lose at home, I’m tired of them losing to teams they should beat and I’m tired of the musical chairs they have had to play with their starting lineup. I’m worried some about their struggles on defense so far. 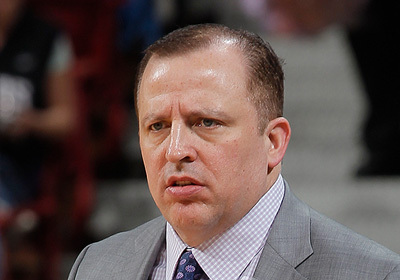 But – the Bulls have the best defensive coach and two of the best defensive players in the NBA. This is no longer the young, up-and-coming try-hard bunch we’ve seen over the last few years. The adjustments they need to make to turn some of these losses into wins are minor. This is a legit NBA championship contender. So, as long as they can all stay healthy, I still believe the Bulls could be the best team in the NBA.